Alumni Weekend, Oct. 25-26, 2019. All SOM alumni welcome! Mark your calendars now and join us in Sacramento. ALL SOM alumni are welcome! Consider a gift to the SOMAA Scholarship Fund. Every contribution has an impact. Students receive expert mentorship from alumni volunteers. Willing to be a resource to our students? Alumni volunteer opportunities abound. Make our community and alumni network stronger. Send us your latest news and update your contact information. makes an impact. DONATE TODAY. 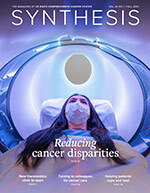 Read the latest issue of UC Davis Health, a publication for alumni, donors, faculty and friends. Keep in touch with what’s happening at UC Davis Health and School of Medicine Alumni Association.